I got bamboozled by the Hype Machine, the one that praised Lorrie Moore's past work and assured me I'd be dazzled by her new stories and her stylish prose. I'm not a fan of short stories in general; my preferences gravitate toward complex characters, plots, and story development that need space to unfold. Courtesy of the hype, though, I put aside my short story skepticism to give Moore's first new collection in 16 years a try. I ripped through this thin volume very quickly, but not in a good way. Overall, Bark lacks bite. 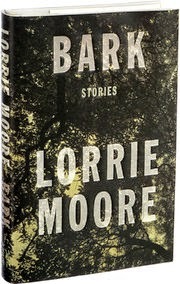 Moore's new work consists of eight stories, each of which muses upon or mentions some meaning of the word bark. Clever or a contrivance? More the latter I fear. The most affecting story is the first, "Debarking," in which Ira comes to shed the wounds of a recent divorce. His interlude of self-flagellation preceding revelation includes a completely incompatible relationship with Zora, a pediatrician creepily over devoted to her sullen (spoiled? psycho? garden variety jerk?) son. In this sense, bark is an unpeeling of outer layers–much as a cork tree's exterior must be cut away to get at its inner cork/core. It's one of the longer pieces in the book, which may be why it works–we dwell long enough in the psyches of its characters to understand what makes them tick and what makes them unwind. It's downhill from there. "Juniper Tree" is a diverting ghost story, but nothing special; "Foes" a rather obvious cautionary tale against snap judgments with a 9/11 twist that's more hammered in through the cracks than woven into the story's fabric. "Wings" could have/should have been a contender. It has an intriguing set up in which KC, a self-absorbed hipster/singer, and Dench, her boyfriend/artist, find themselves exiled in suburbia. KC encounters an elderly widower who shows her what she already knows: that Dench is a mooch and a genius only in his own mind. Then the story takes a weird turn, elides time, and ends on an improbable note. Oh yeah, KC meets the old man when she walks the dog. If that sounds a bit forced, it is. Bark! Bark! Woof!